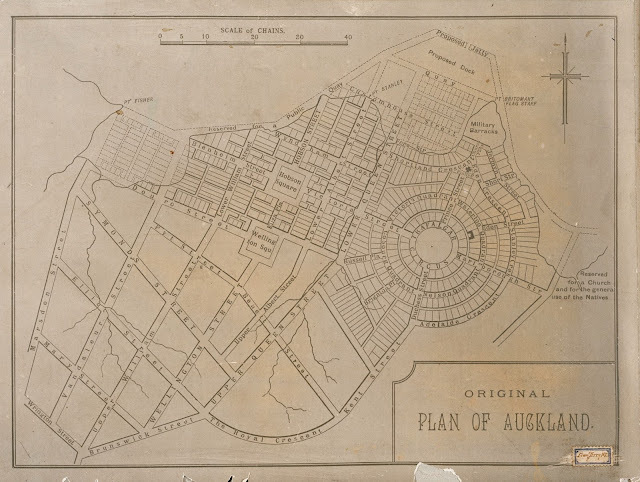 Many maps and plans of Central Auckland have been drawn and published since the 1840s. The first and most well-known was drawn by Surveyor-General, Felton Mathew, for Governor Hobson and published in 1841. Mathew’s design was best known as ‘the cobweb plan’ because it envisaged a circular Trafalgar Circus (where the university is today) with radiating quadrants and a crescent connecting with Upper Queen Street. Mathew’s plan was thought impractical by many influential settlers so was eventually shelved. The only echo of Mathew’s plan that survives today is Waterloo Quadrant (originally to have been named London Quadrant – but now not even actually a quadrant) and which runs between Old Government House and the High Court. Following the news that the J. T. Diamond Collection has been inscribed onto the UNESCO Memory of the World documentary heritage register, we thought that a photographic blog series featuring some of the great images from the collection would be appropriate. 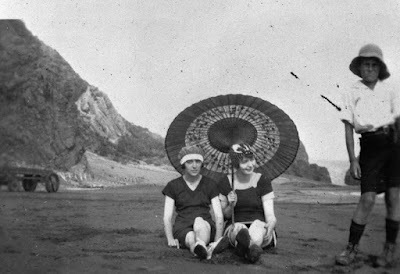 Spectacular Whatipu Beach attracted many day trippers and holiday makers in the 1920s and 30s, and even then little boys photobombed family portraits! Following the fashion for the Orient at the time, these two bathing beauties in substantial swimming costumes and stylish swim hats, sit beneath a parasol on the beach at Whatipu near the Gibbons' boarding house.